It should be obvious from the rest of this web site that squatting is of immense importance in maintaining the mobility of many parts of the body such as the ankle, the knee, the hip joint and the spine. Why then, you may ask, do I only suggest a few minutes a day of squatting as opposed to half an hour at least of slumped sitting? The answer is probably that it is less convenient, less easy to do in any form of tight clothing and not particularly comfortable, if one has not been squatting since childhood. Don't forget however how effective even five minutes of squatting will be, as a stretch, in comparison with only 10 seconds or 30 seconds spent stretching the particular muscle. This is why these small items of lifestyle are so immensely important to Natural Joint Mobility. 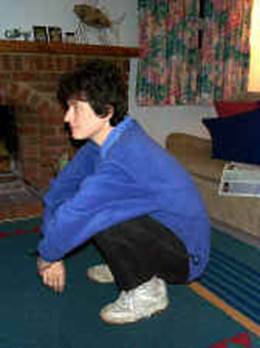 It should also be noted that squatting is used as a normal ground sitting position by the most naturally living peoples and almost certainly has been for the last 5 million years. Numerous problems will be caused by the lack of squatting in our lifestyle. The Principle of Ndjmayl once again! As with slumped sitting, there follows a large list of the positive effects on various parts of the body. The mechanical effect in stretching the spine, the abdominal muscles and the diaphragm will be very similar to slumped sitting. I will therefore start with one or two effects which are different. When squatting the hip joints will be in full flexion. The muscles that limit this flexion are attached to the Ilium on each side and will apply a flexion force to these bones of the pelvis. This force will be opposed by the forces applied by the spine onto the pelvis. Some of these forces will be applied to the ilia but most of the forces from the spine will be applied to the sacrum, which is the direct continuation of the spine. Many of the most important spinal muscles connect to the most prominent part of the sacrum via the erector spinae apponeurosis. The effect of these two opposing forces is to apply a large flexion force on the sacrum inside the pelvis whenever we are squatting. That is: a large flexion force on the sacro--iliac joints. This has been happening for hours per day for 5 million years. On the Ndjmayl principle the ligaments around the sacroiliac joint will have strengthened to withstand this flexion force. If we do not squat in our lifestyle, then these ligaments will tend to limit the mobility of the sacroiliac joint unnaturally and, since it is not a very mobile joint anyway, the mobility may be completely lost. As I tell my patients, most osteopaths and chiropractors make most of their money by loosening the sacro-iliac joints. These joints are involved in almost all cases of low back pain and seem to be able to cause all sorts of pain both locally in the buttock and down the leg. There is another, possibly more important, implication here. I'm suggesting that the mobility of the sacroiliac joint will be significantly greater in those who live in natural lifestyle, which includes squatting. The mobility of the sacroiliac joint will be important in childbirth in two detailed ways. If the local ligaments around the joint allow significant flexion then they will also be looser and allow these joints to separate more, as they are required to do, during childbirth. In addition a large mobility in the sacroiliac joint implies a looser, that is longer, sacro-spinous ligament, (and possibly other ligaments also). It is often said that childbirth is far more difficult for those living our lifestyle than for those who live a more natural lifestyle. The lack of squatting may be an important part of this. I have explained under slumped sitting (or will have done when I get it written!) why these forms of sitting do not cause a rounded upper back and are in fact the best way of avoiding this normal consequence of a civilised lifestyle. The desirable effect is even stronger when squatting and this may well be why the upper back and neck of the most naturally living peoples is so beautifully straight.